The Whitewater Progression Course is a 34 hour course designed to go from little or no skill level to beginner whitewater paddling in as little as 6 days over a 2-week period. During the rapid progression course your learning environment will start in the pool or fresh water lake. 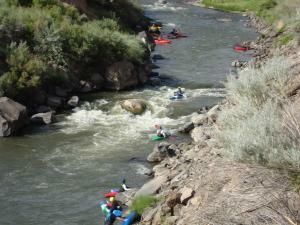 As you progress you will transition to the class I Rio Grande Bosque, then to the class II-III Rio Grande in Taos, finishing up with our Level 3 Whitewater Weekend course. These river trips will be punctuated by additional skills clinics during this 6 day course. You will be introduced to two separate skills clinics, where we will work on our paddle strokes, boat balance, and learning the kayak roll. Teach the progression of skills and techniques required to kayak any Class I, Class II, and Class III river. Teach the foundations of Strokes, Reading the River, Breaking in and Peeling out of Eddies, Common Sense Rescue, Roll Progression and Basic Attainments. Teach the above skills in a natural progression, with both on river time and pool time. During the 4 hours class we will cover, outfitting the kayak, wet exits, basic self-rescue, and strokes and concepts. During this 2 hour skills clinic we will refresh the ideas and concepts learned during the 4 hours L-1 Class. Working as a self-discovery class we will provide instruction based on the student’s needs. Paddling skill development will be facilitated by playing a variety of aquatic games. During this 4 hour class the student will experience their first river trip in a kayak on the Rio Grande, Bosque section. Student development will center on the skills required for safe navigation down river, such as: Identifying river hazards, reading the river, ferrying, breaking in and peeling out of eddys. We will continue to expand on the skills previously learned in L-1. During this 4 hour class the student will learn the concepts of proper kayak rolling technique. The class is broken into two parts, the first being the classroom, where we will watch and dissect the key components of the kayak roll, bracing, and leans. We will then move to the pool and begin to put the pieces of the puzzle together. By the end of class we will have covered high and low bracing, leans, wet exits, hip snaps, the setup and execution of the kayak roll. During this second session of the Sandia Lakes Skills Clinic, we will continue to work on the skills we have learned thus far. Instructors will be more hands on in assisting in the kayak roll progression, T-rescue, edging, and bracing. This last component will be broken down over two days of instruction. The first day will include our famous Introduction to Whitewater 101, class room lecture, followed up by skills development on the river to include: down river navigation, reading the river, ferrying, breaking in and peeling out of eddys, and group dynamics and river leadership. During the second day we will expand on the skills learned on the first day, and review them in the morning. We will talk about common sense river rescue and practice with throw ropes. We will then break off from the riverside class room and start our trip down the river. NMKI Paddle Progression Class is a 3 month long instructions based class. During this class our students will receive a minimum of 34 hours of instruction, and two river trips. Upon completion of the Paddle Progression Class, the student will graduate by running a Class III river utilizing the skills gained in all major components of this class.